With all the hubbub about the Samsung Galaxy Note 3 and the Galaxy Gear, any hype surrounding a new Galaxy Note tablet prior to IFA 2013 was severely downplayed -- but worry not, because you'll be able to get your S-Pen fix with a fresh Note 10.1 regardless. The new version of the tablet device, aptly dubbed the 2014 Edition, reflects the leather-clad design language of its smartphone companion in a much larger package. We had the opportunity to briefly play with the latest and greatest Note tablet, which will be rolling out globally this quarter in jet black and classic white, though pricing and specific availability is still unknown at this point. We've compiled a full gallery of images for you to enjoy below, and then continue past the break to get more of our first impressions. We'll start off with the hardware. The 2014 edition, as we mentioned earlier, is closer to the design language of the Note 3 than its own predecessor. It offers the same "leather-like" material on the back, with stitching on the borders. While this likely doesn't add anything to the tab's overall durability, it at least exudes more of a "classy" look -- though it isn't a perfect solution to a lengthy build quality concern, we at least prefer this over the previous model's glossy plastic, which loved fingerprints more than life itself. Samsung has also decided to go with a single color across the back (with your choice of black or white), rather than a two-tone scheme as seen on the original Note 10.1. Don't be fooled, however, by the chrome edges of the device: while they look like aluminum from a distance, Samsung reps informed us that they are indeed a plastic build; true enough, when you take a closer look, it's much more readily apparent -- and it makes the tablet look cheaper as a result. There's not much to the back of the new 10.1, as it features an 8MP rear camera with BSI and AF and LED flash below it -- and that's about it, aside from the obligatory logos. The units we looked at offered both a Samsung logo and the global LTE symbol (in other words, not the special US LTE logos). You'll be able to choose between this version, which will be available with a 2.3GHz Snapdragon 800 chipset, and 3G / WiFi or WiFi-only models, which will use the Exynos Octa-core chipset clocked at 1.9GHz. In our brief time with the device, we expectedly had no qualms with the snappy performance, largely thanks to the next-gen silicon. Also, it shouldn't come as much of a surprise that unlike the Note 3, the 2014 edition doesn't come with a removable back cover nor replaceable battery. Still, we doubt that the 8,220mAh battery stuffed inside the device will be much of a reason for anyone to complain; this should give you more than enough life out of your tablet in between charges. You won't find the front to be anything overly unique visually, though Samsung is now offering the set of three buttons (two capacitive and one physical) on the bottom of the tablet when held in landscape mode; the company used the same setup on the Note 8.0 but had it situated in portrait mode instead. Both capacitive buttons are compatible with the S-Pen, which makes it much easier to get into the menu or go backwards without having to set the stylus aside. A 2.0MP camera sets up on top and just a little off-center, right next to the proximity sensor. As for the display itself, Samsung is using a WQXGA (2,560 x 1,600) LCD panel, which translates into a pixel density just barely shy of 300 ppi. 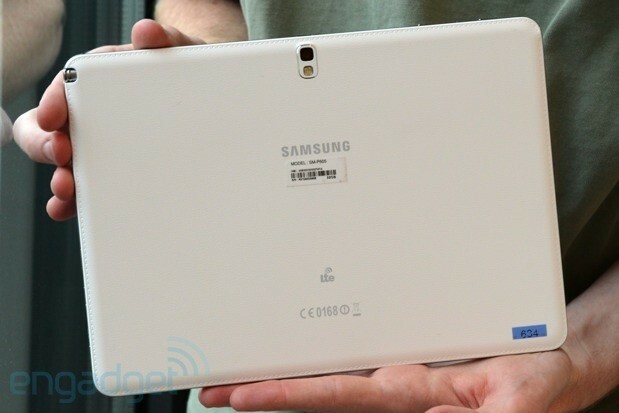 We've seen this kind of screen in another recent Samsung device: the Nexus 10. This is one of the best you can get on the market for a tablet of this size, and we were just as taken with it this time as we had been in its first physical manifestation. In addition to the specs we've already mentioned, the Note 10.1 will also give you 3GB RAM, Android 4.3 Jelly Bean, compatibility with the Galaxy Gear, dual-band WiFi 802.11a/b/g/n/ac support, Bluetooth 4.0, USB 2.0, your choice of 16, 32 or 64GB internal storage and microSD support for up to 64 additional gigabytes. It also supports 192kHz and 24 bit audio. We don't want to spend too much time on the software because the enhancements we saw on the 2014 edition are exactly the same as they are on the Note 3, and we go into more detail about those changes in our preview of that device. The Flipboard-style Magazine UI is there with a swipe up from the bottom, and you'll have the chance to take advantage of Air Command, Scrapbook, Multi-Window enhancements and Pen Window, among other features. Curiously, we noticed that the S-Pen was a little more difficult to unsheath from its holding place, much like the Note 3; we're not sure if this is more noticeable because it's a pre-production device or if it gets easier over time, but it felt to us as if the pen was simply too flush with the rest of the unit, with only a tiny spot at the end for our nails to grab it and pull it out. We'll have to wait and see what kinds of changes, if any, will take place between now and the device's actual launch. Either way, we'll certainly be waiting to review it, and we'll give you the full scoop on the latest and greatest Note tablet in Samsung's lineup. Berlin, Germany – September 4, 2013 – Samsung Electronics Co., Ltd., a global leader in digital media and convergence technologies, today unveiled the GALAXY Note 10.1, 2014 Edition, an original approach to balancing productivity, powerful content creation and consumption in one portable tablet device. Equipped with WQXGA Super clear LCD (2560x1600) resolution in a stunning 10-inch display, 1.9 GHZ Octa Core processor (for 3G / WiFi only version) and 3GB RAM, the GALAXY Note 10.1 (2014 Edition) demonstrates Samsung's innovation leadership by delivering ultimate productivity capabilities while remaining extremely thin and light. "The new GALAXY Note 10.1 is the most progressive 10-inch tablet, delivering the best viewing and multitasking experiences. It is the most recent demonstration of Samsung Mobile's focus on constant product innovation to stay aligned with shifting consumer interests," said JK Shin, CEO and President of IT & Mobile Division at Samsung Electronics. "The GALAXY Note 10.1 (2014 Edition) unites a range of features that will consistently surprise consumers as they realize how much easier and more enjoyable it makes their everyday lives." The device's screen size also enables enhanced multitasking. With Multi Window, users will be able to run separate instances of the same application, and use an enhanced S Pen to drag and drop content from one window to another. Pen Window enables users to simply draw a window of any size on the screen, and instantly access unique in-application features such as YouTube or calculator. The updated S Pen included with GALAXY Note 10.1 improves responsiveness, delivers day-to-day efficiency enhancements and produces more creative input capabilities. 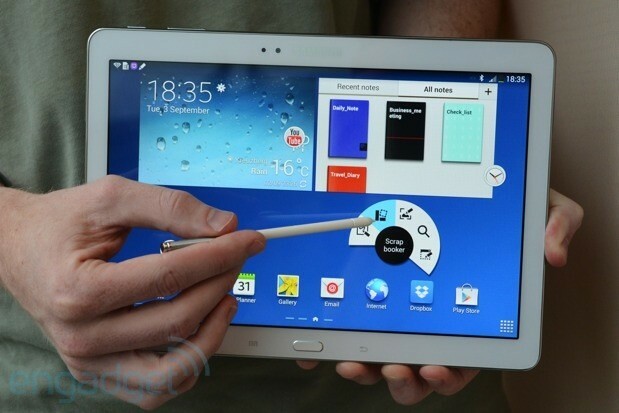 The tablet also includes GALAXY Note 3's updated S Pen features such as Action Memo, Scrapbook, Screen Write and S Finder. Combined with the tablet's larger screen, these enhanced S Pen capabilities present users with unique creative opportunities and the space to explore them. The new GALAXY Note 10.1 will also offer a host of exciting partner content that complements the device's entertainment, productivity and creativity properties. With premium partner applications and free memberships and services, the new GALAXY Note 10.1 provides everything a user might need in one place. The Samsung Content Gifts include content from leading news sources such as Bloomberg Businessweek+, The New York Times, Autodesk Sketchbook for GALAXY for painting and sketching, a redesigned version of social broadcast network Twitter optimized for the device, and much more. 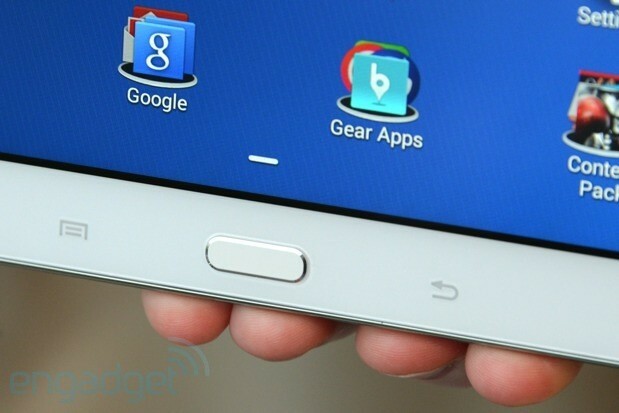 In addition, the GALAXY Note 10.1 (2014 Edition) will also include a Samsung Apps widget that will direct users to additional beneficial content provided by Samsung. The widget will live on the home screen and include a "Special Offer for GALAXY" section that will highlight unique, country-based content for users.